If there was a non-rotating skyhook in Earth orbit, what would re-entry be like after dropping from its foot? I have been looking at a space station that orbits Earth at an altitude of 3500 km above the equator, and has tethers that extend from it downwards to 250 km above the surface, and outwards to 6500 km altitude - a non-rotating skyhook. Right now I'm considering what would happen if a Dragon or Soyuz type re-entry capsule was dropped from the foot of the lower tether and returned on a ballistic trajectory. I used the Tether Tool (written by our own Hohmannfan) to find the velocity of the foot. It was written first for the Moon and the rest of the solar system has recently been added to it. Don't forget to change the selection to Earth at the top. The station at 3500 km altitude rotates with a period of 2.711 hours. At the foot (altitude = 250 km), this corresponds to a speed of 4.26 km/sec, or about half of the re-entry speed of a satellite from LEO. Since it's moving in the same general direction that the atmosphere is rotating, the speed relative to it is about 0.5 km/s less than that. Assume this is all in the plane of the equator. A Dragon 2 weighs 6400 kg empty. If it was returning one person perhaps it's fair to increase that to 6500 kg. On such a steep descent, would it need to have a larger area facing into the wind, (perhaps an inflatable decelerator)? What sort of descent time would be involved before the parachutes deploy, if it was set up to slow properly? What would be the peak deceleration? Together, that is maybe a lot to ask. It seems like it all belongs together. All input appreciated. The numbers you cited match mine fairly closely. A very nice tool Hohmann fan has made available. I intend to link to his page from several of my tether blog posts. The bottom of the spreadsheet answers some of the your questions. I called 70 kilometers the altitude where the craft starts serious aerobraking. Which is just a guess, to be honest. The ship would be moving 4.6 km/s at that altitude. It would 7.3e-1 hours to reach this altitude which comes out to 43 minutes. Scratch that - it is a mistake. Thank you for calling that to my attention, uhoh. 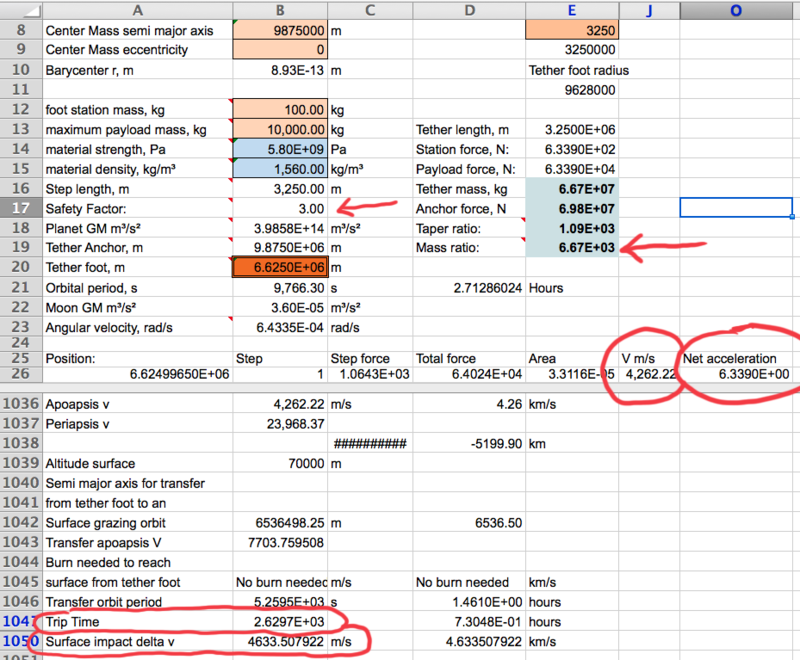 The bottom of the spreadsheet was a transfer orbit from a 250 km apogee to a 70 km perigee. But in this scenario perigee is well below earth's surface and the ship re-enters well before perigee. The eccentricity of the suborbital ellipse is .698. Semi major axis of that ellipse is about 3902 kilometers. Given that semi major axis, the period would be 2425 seconds. But only a fraction of that period is swept out from release at apogee to atmospheric entry at 70 km. 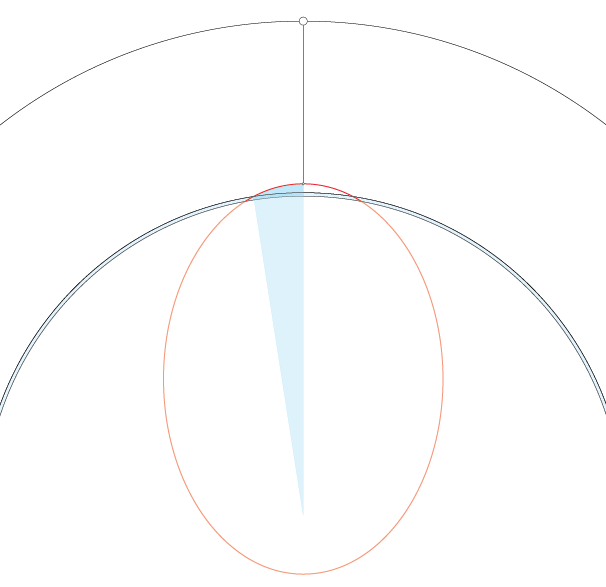 That fraction of the ellipse is shaded blue. 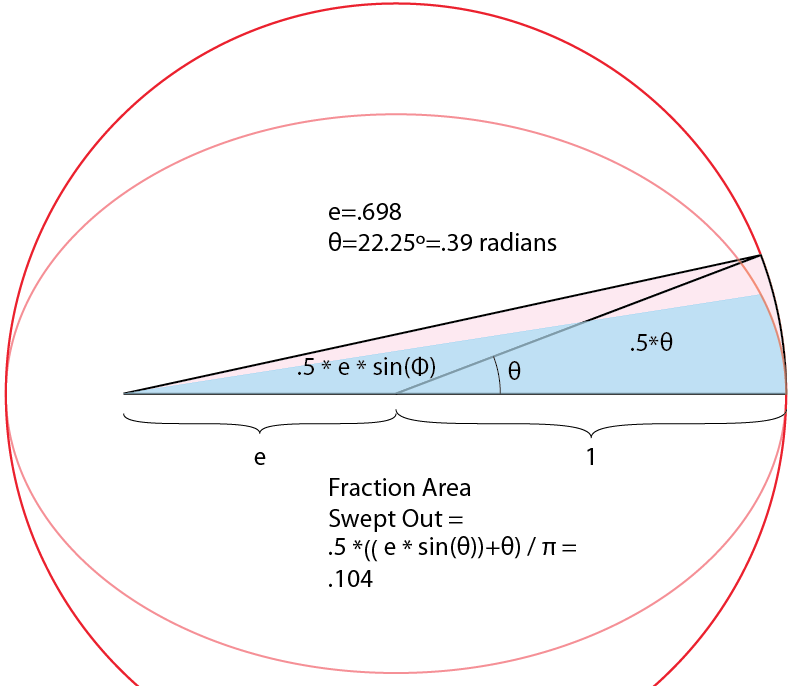 To get area of the fraction of an ellipse swept out, Kepler scaled the ellipse to make it a circle. Which is what I did. I also scaled radius of our circle to 1 to eliminate some arithmetic. To get area swept out, Kepler would add area of a triangle and a wedge. Which is what I did above. In this case a little more than 1/10 of the ellipse. .104*2425 seconds is about 252 seconds. Or about 4 minutes and 12 seconds. After release from a 250 km altitude, the spacecraft would start serious aerobraking in about 4 minutes. At 70 km altitude I get a flight path angle of 19.2º. Horizontal velocity would be be about 4.38 km/s. Vertical velocity would be 1.53 km/s. The short path from a 70 kilometer altitude to earth's surface doesn't give much time to shed the 4.64 km/s velocity. As the capsule descends gravity will increase slightly, centrifugal acceleration decreases rapidly while deceleration from dynamic pressure increases rapidly. This is within about 4% of what I got using Kepler's method to get time of flight and the Vis Viva equation to get speed at 6378 km (earth's radius). To get atmosphere density at an altitude I use $exp(-altitude/scale height)*1.225 kg/m^3$. I call 8500 meters the scale height. Dynamic pressure is $.5*\rho*v^2$). Force newtons is dynamic pressure x drag coefficient x cross sectional area capsule. Impact velocity: 150 meters/sec which is about 333 mph. Max Q: 217 kilo pascals. I've been told 90 kilo pascals has been a Max Q for descent. I am guessing 217 kilo pascals is unacceptable. Impact velocity: 92 meters/sec which is about 205 mph. Max Q: 87 kilo pascals. Here Max Q is less than 90 kilo pascals. This may be acceptable. I don't know what how to figure heating. If made of Zylon with a safety factor of 3, the lower tether would have a taper ratio of about 1090. Tether mass to payload ratio would about about 6,670. I think with that great length it would have a large enough cross sectional ratio that impacts would be inevitable in the LEO volume which has lots of debris and satellites. As much as I love vertical tethers, I don't believe they could survive close to earth. A rotovator might be a way to catch suborbital flights as well as release re entering craft into the atmosphere at suborbital speeds. John Carmack has already tweeted to Musk if he can land a booster on an ocean platform, he should be able to rendezvous with a rotovator. Musk agreed, sort of. tl;dr Everyone will die within five minutes. Your plan is a non-starter. You must consider letting go from a much lower altitude, or higher forward velocity, or convert your capsule into a spaceplane the likes of which do not yet exist. Here is some physics. 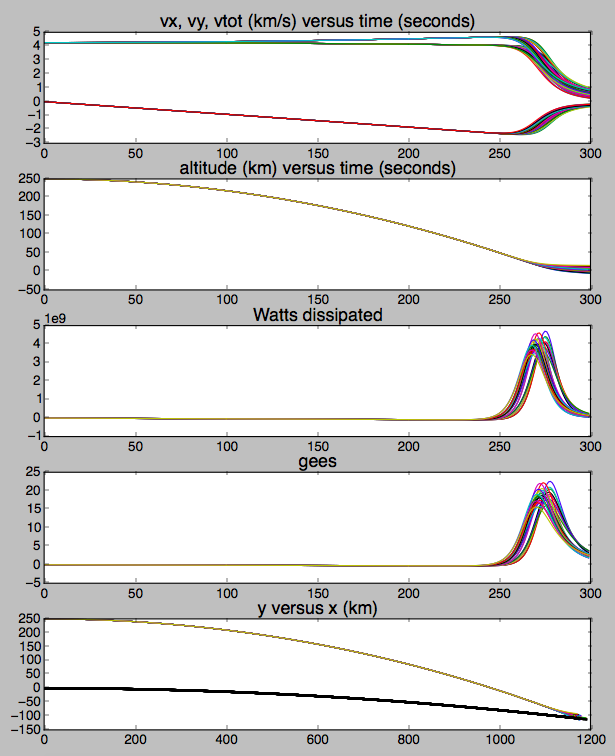 To get an approximate idea what the re-entry would be like, I've used a simple scale-height model of atmospheric density (7, 7.5 and 8 km), constant drag coefficient (0.2, 0.5, and 0.8) and a constant lift-to-drag ratio (0, 0.15, and 0.3). With all 27 combinations you get a peak heat production between 3 and 4 gigawatts, and a peak deceleration of between 15 and 20 gees. These should be compared to values from survivable reentries. The problem is that it's dropping for nearly 200 km before it hits enough air to really start losing energy. It would be better to let it go in the ballpark of 100 to 80 km so it can get rid of a lot of energy before it starts sinking too fast and the air gets too dense. Not the answer you're looking for? Browse other questions tagged reentry space-tether or ask your own question. What would the damage radius be if a Falcon 9 booster impacted the Earth without a landing burn? How possible are 'space jumps'? Would it be possible to get back to Earth from the ISS without any ground support? If you swam towards Earth from Space would there be a point when you started falling? What would be the challenges of a non-rotating tether orbiting the Moon? What are the conditions for re-entry of an object in a (highly) elliptical orbit? What is making the glow from this image of STS-135 going home, de-orbit burn or re-entry? What would happen if air hitting heatshield was ignited?